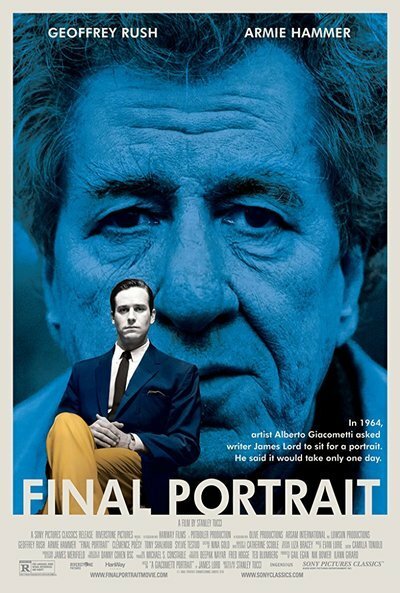 “Final Portrait” is an adaptation of that memoir written and directed by Stanley Tucci. Like a couple of other directorial efforts from Tucci, who’s primarily known as an actor, this is a picture about process. His 1996 “Big Night” is the story of the making of an epic meal; 2000’s “Joe Gould’s Secret” is a dual portrait of two writers with very different approaches to work (and very different results). Giacometti, a self-described “Italian Swiss” now ensconced in a ramshackle mini-compound containing studio and living quarters in Paris, is played with shambolic gruffness by Geoffrey Rush. Armie Hammer’s straight-standing, composed James Lord seems the artist’s polar opposite, but the two have a kinship—Lord has a deep understanding of Giacometti’s artistic language. Still, the artist’s relentless self-doubt puzzles Lord. Lord protests that Giacometti’s success ought to have erased that. Quite the contrary, the artist observes: “What better breeding ground for self-doubt than success?” The trappings of success mean little to him, either. He makes millions of francs in sales, but almost literally throws it away; what he doesn’t, he hides in various nook of his studio. As Alberto begins, erases, and again begins the portrait, James interrogates not just the artist but his brother and assistant Diego (Tony Shalhoub), his dutiful, very drawn-looking wife Annette (Sylvie Testud). Another presence is Caroline (Clémence Poésy), a local prostitute with whom the artist is highly invested, to the point of buying her a sporty new BMW. The movie is a minimally lovely treat to look at. Tucci and cinematographer Danny Cohen desaturate the colors at the beginning, giving the movie a black-and-slate-gray look from which blues and reds try to fight their way into the viewer’s perception. The evening scenes, many of them spent at Giacometti’s local, Café Adrien, have a golden warmth. The mobile camera, which on occasion becomes a trifle too shaky, negotiates the artist’s studio with a crafty curiosity. This movie is a chamber piece, and even at its modest 90-minute running time, it gets a trifle repetitious—Alberto picks up the brush again, James sits down, the camera produces a series of extreme close-ups of James’ face (it’s the head that the artist has the most trouble with). It’s a nice face, with excellent pores, but, you know. Still, the depictions of artistic struggle and mania, the communication of the artist’s frequently painful bubble, are insightful and rewarding. The warts-and-all depiction of Giacometti, which establishes a credible explanation if not excuse for the many selfish acts he’s seen doing, winds up being an apt tribute to both the artist and art itself.